Best selling author and innovation expert Daniel Burrus recently described what an evolved mobile strategy looks like in the article titled Does Your Organization Have a Mobile Strategy to Accelerate Growth? 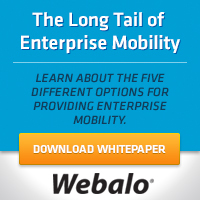 "When you think about mobility, don’t just think about devices and apps and how you might use those. Step back and create a bigger strategy, because mobile is far bigger than that. Instead, ask yourself,"
Transform how we share knowledge? I know we often discuss topics like HTML5 vs. native apps and the different kinds of mobile application development tools and platforms here, and these subjects are important, but the impact of digital and business transformations caused by social, mobile, analytics and cloud technologies are having a far greater impact on industries than many people have yet to grasp. I wrote an article last week titled SMAC, Mobile Collaboration and Google, which explores how Google is empowering social, mobile, analytics and cloud adoption in their solutions. The ability to have incredible computing power, connections with people, social and collaborative capabilities and access to massive amounts of information at the touch of your finger anywhere there is an Internet connection is today changing the way we live and work. Does your company recognize this? What are they doing about it?